As a policy document, the Comprehensive Plan is to be used to communicate the preferred use of land in designated areas for achieving the vision of the County within the land use context. It is a tool that can be used by the County’s elected officials, staff, and citizens to evaluate various land use options and development proposals for compatibility, suitability, as well as sustainability. This Plan uses the most current information available to define and document the existing land uses within the County, and their general locations. A key objective of this Plan update was to incorporate new information, from sources such as the 2010 U.S. Census and numerous recent studies and reports, to create an accurate picture of the County as it is today, and to use this information as the baseline for planning over the next 5 to 20 years. The Plan describes the major priorities related to future land use that contribute to achieving our vision. Priorities such as protecting historical areas and natural resources, preserving our farm lands, supporting private enterprise which will expand our local economy to create jobs and revenues, retaining the character of our communities and meeting the requirements for public facilities. We wish to retain the characteristics that give identity to the mix of communities that exist within the County. We understand that a vibrant economy contributes to the sustainability of our community and our quality of life. Wise resource planning and land use decisions directly impact our ability to attract and support a business base, while maintaining the rural nature of the County. Following its revisions to the Comprehensive Plan, the Orange County Planning Commission held a Public Hearing on the Plan on August 1, 2013, and subsequently forwarded a recommendation of approval to the Board of Supervisors. 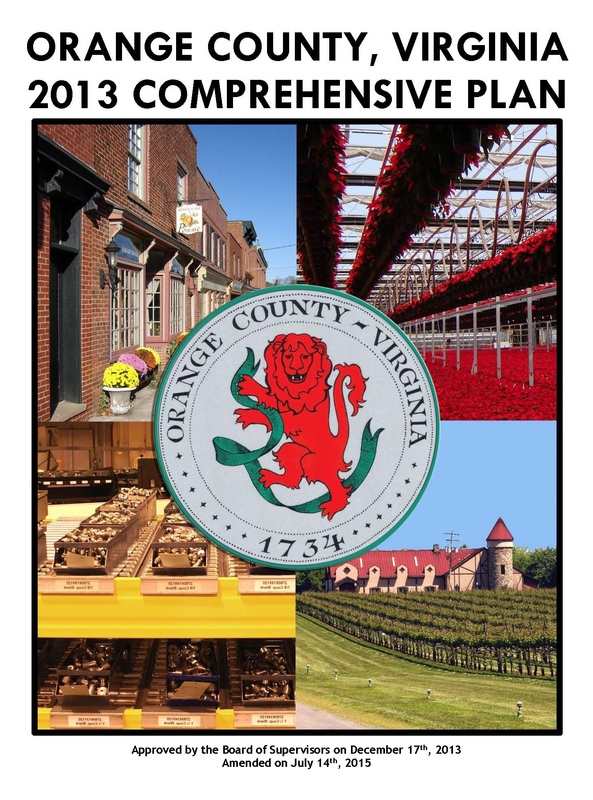 Following its revisions to the Comprehensive Plan, the Orange County Board of Supervisors held a Public Hearing on the Plan on October 22, 2013, and adopted the Comprehensive Plan on December 17, 2013. To view the Board of Supervisors' Resolution to Adopt the 2013 Comprehensive Plan, dated December 17, 2013, please click here. On Tuesday, July 14, 2015, the Board of Supervisors held a Public Hearing in order to adopt amendments to the 2013 Comprehensive Plan and incorporate the Germanna-Wilderness Area Plan. A minor amendment was also adopted on October 27, 2015, to officially declare the Germanna-Wilderness Area as a designated growth area. Another minor amendment was adopted on May 8, 2018 to adequately describe planned public facilities. To view the adopted Comprehensive Plan, dated May 8, 2018, please click here. To view Appendix B (the Germanna-Wilderness Area Plan) of the adopted Comprehensive Plan, please click here.